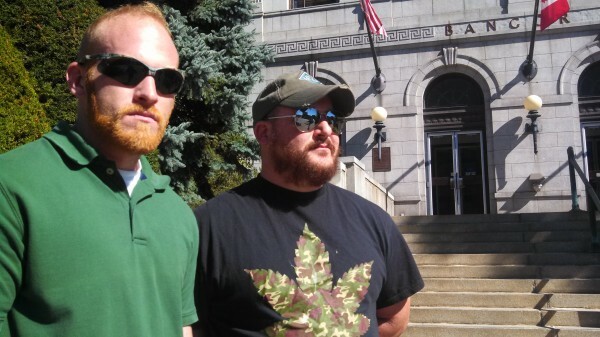 U.S. Marine Corps veterans and medical marijuana patients Bryan King and Ryan Begin lauded a change in law that allows people suffering from post-traumatic stress disorder to obtain prescriptions for medical marijuana on Tuesday. They participated in a press conference on the steps of Bangor City Hall on Tuesday, Oct. 1. Even routine events like driving under an overpass or hearing a loud bang can cause a person with PTSD to shut down or react aggressively, he said. Marijuana eases Begin’s stress, which is why the Montville resident said Maine is taking the right steps by allowing veterans and others suffering from PTSD to take advantage of the drug. Begin and Cpl. Bryan King, a retired Marine and medical marijuana patient from Fairfield, stood alongside representatives of the Medical Marijuana Caregivers of Maine and the American Civil Liberties Union Tuesday during a press conference celebrating a change in state law that will allow doctors to prescribe medical marijuana to patients suffering from PTSD. The law, stemming from a bill proposed by Rep. Elizabeth Dickerson, D-Rockland, goes into effect on Oct. 9. The update also will allow physicians to prescribe marijuana to patients with inflammatory bowel disease and a few other illnesses. It will take effect without Gov. Paul LePage’s signature. “It’s a safe and effective medicine, significantly more safe than the pharmaceuticals used to treat PTSD,” King said after a press conference held on the steps of Bangor City Hall. He said other drugs are far more harmful physically and mentally. Medical marijuana allows “access to thoughts,” rather than covering them up. It allows the user to think clearly about their situation and cope with their fears rather than muffling them, supporters said. Begin said marijuana still allows a person to feel fear as they approach a stretch of road that reminds them of an ambush point or enter a crowded room, but that the fear “flows through” them in a few seconds as they process their thoughts, and then subsides. “It takes the edge off of everything, but you’re still able to function and be with everybody present and not be in some sort of daze,” King said. Resistance eased after the language was changed. A similar measure was signed into law earlier this month in Oregon, according to the Marijuana Policy Project. Medical marijuana is currently allowed in the treatment of PTSD in California, Connecticut, Delaware, Massachusetts and New Mexico. Begin and King said they hope medical marijuana will help more veterans ease the worst of their PTSD and quickly integrate back into their communities as they return from war.